BEST PRACTICE: Know that pears are a high impulse purchase item. 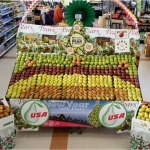 Create large, eye-catching pear displays in highly visible areas to increase impulse sales. About half of pear purchases are made on impulse, meaning many shoppers didn’t plan to purchase pears until they were attracted to the store display. 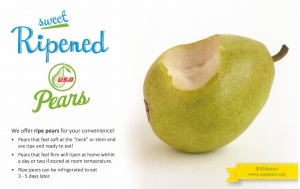 Follow recommended USA Pears best practices to maximize sales potential for pears. 1. Place pears in the front of the produce department to increase visibility. Retail data from Pear Bureau Northwest shows that 52% of the displays at top-performing pear retail stores are positioned in the front of the produce department. 2. Create a destination pear display with multiple varieties of pears positioned together. Each pear variety offers shoppers a unique taste, texture and versatility. Displaying them together will maximize attention and allow shoppers to easily compare varieties. 3. Use natural color breaks to create eye-catching displays. Position green pears next to yellow pears next to red pears and so on. This contrast in color attracts customer attention and drives shoppers to purchase more varieties as they note the differences among varieties. 4. Decorate displays with seasonal themes such as holidays or sporting events. Halloween, Thanksgiving, Christmas, Valentine’s Day, Easter, and Back-to-School season are all prime times for themed pear displays. Creative displays that take advantage of these themes draw shopper traffic and boost sales. 5. Use secondary displays in high-traffic store areas outside the produce department. Spur pear purchases with secondary displays in departments with products that pair well with pears: cheese, yogurt, wine, deli/sandwiches, hot and cold cereal, bagged salads. BEST PRACTICE: Offer ripe pears on display because 60% of consumers say they want pears to be ripe when they purchase them. Ripe pears outsell unripe pears by 19.5%. A ripe pear program gives consumers what they want – sweet and juicy pears Ripe without having to wait for them to ripen at home – and keeps them coming back for more pears, more often. 1. Offer your shoppers ripe, ready-to-eat-now pears AND unripe fruit to finish ripening at home to eat later in the week. 2. Display pears on non-refrigerated displays so that they can ripen at room temperature. The only time refrigerated displays should be used is for very ripe pears. BEST PRACTICE: Conduct pear demos to boost sales by giving shoppers the opportunity to taste ripe, sweet, and juicy pears. 1. Demo ripe pears ONLY so that pears are being served at their peak sweet flavor and juicy texture. NEVER serve unripe pears. 2. 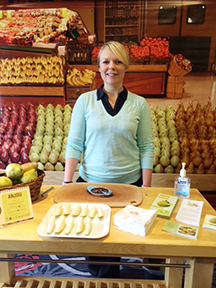 Offer shoppers samples from multiple varieties of pears to entice trial and to drive purchase. 3. Demo stations should be clean and neat, and placed near a pear display. 4. Proactively engage shoppers, educate them about pears and answer common questions. Utilize the resources available from USA Pears to educate yourself, your staff, and your shoppers about pears. Demonstrator kits, videos, and more are available to help make your pear demo effective and easy. 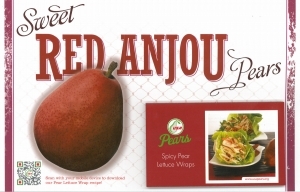 Cross-promotions help to generate ideas for pear usage among shoppers. Displaying and advertising pears alongside products that offer recipe ingredients and simple pairing ideas is a great way to educate shoppers and encourage immediate impulse buys and longer term sales. Create eye-catching cross-merchandising displays inside and outside the produce department to offer mealtime solutions. Display pears with the other ingredients shoppers need for a recipe, for example: pears with bagged salad, cheese, nuts, and salad dressing for a simple yet delicious tossed salad for lunch or dinner. Pears can be a perfect match for cheese, nuts, bagged salad, wine, yogurts, cereal and sandwiches, which are all items that are commonly found in the same shopping basket as pears. BEST PRACTICE: Offer shoppers even more value with promotional pricing and packaging. Promotional pricing will showcase the value of pears and will entice shoppers to purchase more pears – and more varieties – more often. Look at advertising pricing and variety promotions to influence purchase of varieties that may be new to your shoppers such as the Bosc, Red Pears, Comice, and Organics. Promote smaller (of a second pear size) with an ‘each’ price to drive even more sales. Over 60% of consumers are more likely to purchase pears if they are exposed to a recipes, usage tips, flavor attributes and nutritional value. Nutritional Value: Pears are an excellent source of fiber and a good source of the antioxidant vitamin C.
2. Use Recipes to Drive Purchases Pears are versatile fruit that fit any recipe for any meal of the day, from soups, salads, sandwiches, desserts, main dishes, appetizers, smoothies, and more. Offer recipes specific to each variety. Rotate displays frequently, always placing the new fruit on the bottom of the display and older fruit on the top of the display. Regularly inspect your fruit displays during your shift, checking for and removing damaged produce. Fruit that is spoiled, rotten, overly bruised or mushy should be discarded immediately. Clean, attractive displays are more appealing to customers. Bring partially bruised fruit to your store’s deli or prepared food section as it may be fresh and safe to use in other products like fruit salads, juices, and smoothies. Consider creating sample trays with partially bruised fruit as this is a great way to salvage produce and to encourage shoppers to purchase more fruit.